Leading company in the industry, servicing products and technology solutions to many thousands of developers worldwide. Our thanks to our customers for their input to Steema's development during more than 22 years! We've enjoyed working with you. Here at Steema we'll keep the products and solutions coming and hope we can further build on the successful relationships and the feeling of community established with our customers. Steema Software SL company (formerly teeMach) was formed to help meet the growing demand for the then shareware version TeeChart 1.0 VCL for Delphi 1.0 developed by current CEO David Berneda in 1995. Steema's dedication to customer service remains firmly at the forefront, Steema continues to offer customers one of the most comprehensive, cost-value support environments in the industry. Steema Software SL Registration Number (V.A.T.) ES-B62259544 .Registered in Spain. Registro Mercantil Barcelona, Tomo 32592 libro 216573 folio 0030 Sección General. Steema Software SL is registered in Barcelona and based nearby in Girona. 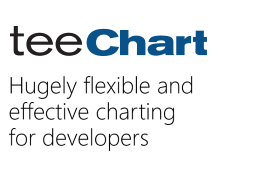 Steema authors, markets, distributes the TeeChart range of Charting Libraries. Contact us! Microsoft Visual Studio Industry Partner.